When you walk into Dark Forest Chocolate in Lancaster, you are met with an intoxicating aroma. Their bean-to-bar process means that chocolate is being made in-house 24 hours a day, seven days a week—and the smell is to die for, at least for visitors. 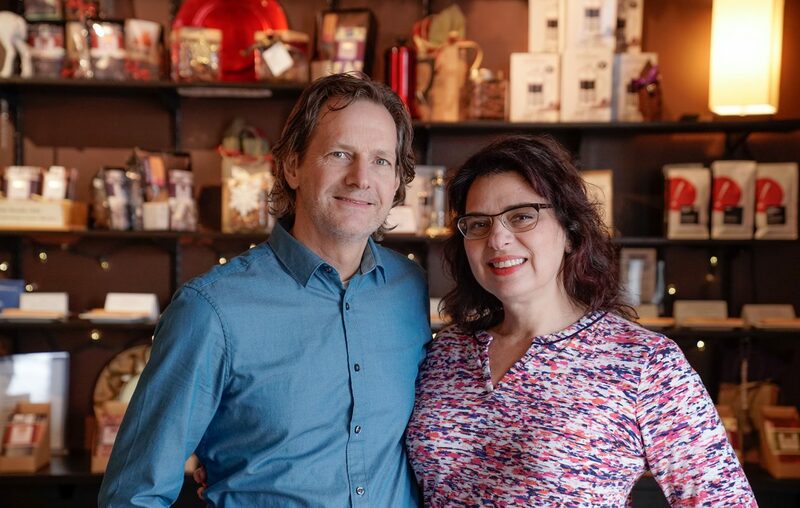 She and her husband Dan are the people behind this brand, which imports cacao beans from tropical jungles and turns them into award-winning chocolate bars. Dark Forest has won silvers and bronzes for their chocolate two years running from the Academy of Chocolate and the International Chocolate Awards. Joanne and Dan were always chocolate lovers, and were on the lookout for a good dark chocolate, but they couldn’t find anything that satisfied them—until about five years ago when they tried a dark bar made from cacao from Madagascar. They learned that just like wine grapes or coffee beans, the soil quality and amount of rain and sun affect the quality of the cacao and the flavors it imparts to the chocolate. So Dan, who is the kind of guy who always needs a project, decided to start making chocolate at home. He bought the equipment and had some early successes, but it was nothing more than a hobby until he was laid off in 2015. “We were at a point where we were like, ‘We’re saving for a rainy day and this is it, so let’s go into business,’” Sundell said. Two years later they won their first awards at the International Chocolate Awards. “It’s great, people come in and I tell them we make some of the world’s best chocolate and they look at me like I’m lying,” she said. The Sundells take pride in their chocolate being natural and healthy. Joanne says that it’s “food, not candy,” and it contains no soy or nuts. It’s also sourced from small cacao farmers who are paid a living wage for their products, unlike most major candy-makers who get their products from commercial farms. They currently have 12 different bars in dark and milk chocolate, but the products rotate based on weather changes and the cacao beans they get from year to year. All about the beans. Cacao beans are imported into the shop in burlap sacks from tropical locales like Ecuador and Madagascar where they are grown. Get toasty. The beans are first roasted to enhance their flavor. Much of the equipment that the Sundells use was designed for a different task, but has been repurposed for chocolate making. The roasting oven is a converted rotisserie oven for a turkey. Time to de-shell. Once the flavor has been developed, the beans are put through a machine that separates the nibs from the shells. Like a peanut, cacao has a protective shell which needs to be removed before the chocolate can be made. Grind it up. The roasted and separated nibs are added to an industrial grinder along with sugar and milk to be processed into the chocolate. Dark Forest will shear together the milk, sugar and cacao for four days to aerate the bitterness out of the chocolate. Aged like a fine wine. When a batch is done, they’re left with a large untempered block of chocolate. It’s then placed on a shelf and labeled with the date it was made for the aging process. Some chocolates are aged a few weeks—others a few months—depending on the variety. Enter the mallet. The untempered chocolate is then broken up into smaller pieces using a mallet and a chisel. The smaller pieces are put into a tempering machine, which heats and then cools the chocolate in a specific way in order to create the candy chocolate we are all familiar with. Once finished, it has a smooth, glossy surface and won’t melt in your hands. Bar time. The chocolate is then formed into bars so that it’s ready for sale at the Dark Forest shop. Once cooled into its final shape, the chocolate bars are hand wrapped into packaging with unique designs—all created by Danny and Joanne. See how other Buffalo Made products come to be, like Bootleg Bucha's kombucha, Norman Cramer's custom furniture and Greg Link's pottery (of Cone Five Gallery).